Changes in temperature in the Southeast over the last 100 years or so have been relatively small, especially compared to other parts of the US and the world. That has led to what we call a “warming hole” in the Southeast that gives people here the impression that global temperatures are not increasing, even though the Southeast is a relatively small part of the entire earth. 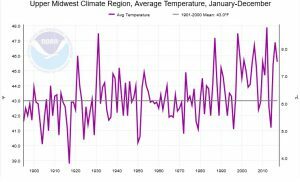 In other parts of the US, however, increases in temperature are much more obvious and the impacts of that increasing warmth is being noticed by agricultural producers in those areas. This article in The Guardian discusses some of the changes that farmers in the Midwest have been seeing and how they are responding to them. 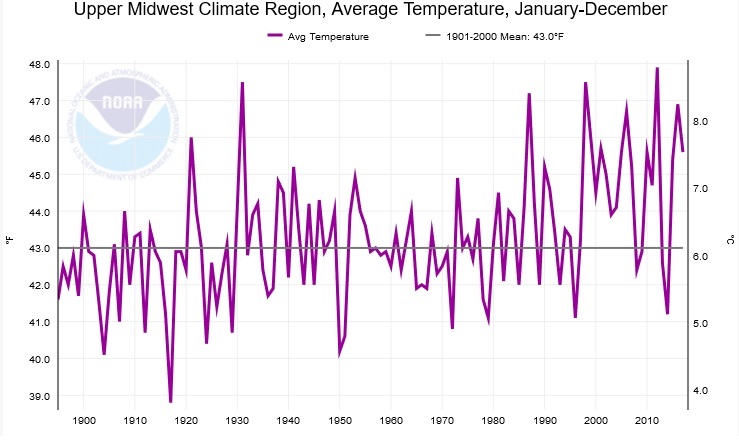 You can read it here and make similar time series for other regions or states at https://www.ncdc.noaa.gov/cag/. Try it out for the Southeast and see how it compares (note that the scales on the vertical axis change as the graph changes, so the graphs aren’t always exactly on the same scale). Posted in Climate and Ag in the news, Climate science, Sources of weather and climate data, Tools for climate and agriculture, Uncategorized. Bookmark the permalink.